Ever wondered what Adele would sound like fronting a middling rock band? Nothing But Thieves has the answer! Nothing But Thieves’ debut album is a 16-track monster, clocking in at just under an hour. This seems almost appropriate, seeing as how the band has a sound that mostly seems to come from the early 00’s. Back when the compact disc still ruled and record companies pushed their acts to fill up the space available to them, this album wouldn’t seem at all unusual. One of the nice things about the music industry’s gradual transition to digital formats is that most acts now seem to opt for brevity, cutting down on the filler tracks to keep short attention spans from wandering away to something else. Nothing But Thieves arrive with credentials, though, or at least hype. Their resumé includes opening gigs for Gerard Way, Awolnation, and Muse, appearances at major English festivals, and semi-successful English radio singles. The fact that they are signed to RCA, still a major label and still with at least some influence to launch new acts, does mitigate those credentials a bit, though. Or at least invite speculation about how much of those credentials were earned and how much were the result of RCA’s coordinated push. The most striking thing about the band is their vocals. Singer Conor Mason sounds like a fairly good Adele impersonator fronting a rock band. Never mind that he’s male, his robust alto voice has the same basic range and many similar sonic qualities to the superstar vocalist. That’s striking, and the band leans into it, with lyrics that mostly don’t deal with relationships. Or, when they do, the relationships are described in fairly androgynous terms, leaving plenty of room for interpretation as to the gender of the point of view of the lyrics. Opener “Excuse Me” is a simple encapsulation of Nothing But Thieves’ basic sound. The song begins quietly, with guitar arpeggios and a simple rhythm section accompaniment backing up Mason’s singing. But at the 50-second mark, the song shifts to a widescreen rock chorus, anchored by Mason’s falsetto howl (impressive, but a bit thin up in that high range) and the bored-sounding refrain, “Excuse me while I run, I really gotta get outta here.” The band doesn’t do the quiet-loud thing all that often on the rest of the album, which retroactively makes “Excuse Me” one of the record’s more distinctive songs. Second song “Ban All the Music” is notable for its jagged main guitar riff, using a staccato tone more often found in post-rock or noise-rock than Nothing But Thieves fairly straightforward style. The song the band builds around that tone and riff is sturdy, but keeps the spotlight strictly on the guitar. Fortunately, the band seems to realize they can’t keep this up for very long and the track ends before the three-minute mark. The bulk of Nothing But Thieves finds the band trying out a bunch of variations on their basic rock sound to varying degrees of success. The dance-rock of “Wake Up Call” works because it has a good beat and bassline, and Mason’s vocals are suited to the style. Ballad “If I Get High” shows what happens when the band relies entirely on Mason’s vocals to carry a song. It almost works as a showcase for his plaintive falsetto, but the music just comes off as a subpar imitation of The Bends-era Radiohead. “Graveyard Whistling” is similarly subdued but has more interesting musical ideas; maybe that’s because it’s easier to do a Coldplay-esque song than a Radiohead-ish song without coming off like a pale imitation. Speaking of pale imitation, “Painkiller” copies TV on the Radio’s classic “Wolf Like Me” so precisely that it not only has a similar guitar tone and the same note progression, it’s in the same key and follows the same basic vocal cadence. It’s almost fascinating that nobody anywhere down the line, from the band themselves to their producers to the A&R people at RCA, noticed (or cared) about this resemblance and cut the song. 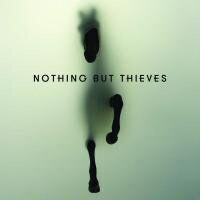 Nothing else on Nothing But Thieves is that blatant, but it’s hard to call anything on the album unique. Some of the tracks work much better than others, though. “Lover, Please Stay” gives the soft ballad thing another shot and does much better by finding a compelling melody for Mason to sing and giving him a simple guitar accompaniment, leaving the rest of the band on the sidelines. “Hostage” could be an early 00’s industrial rock song, with its nine inch nails-style drum machine-esque beat and its pulsing Stabbing Westward bassline. “Tempt You” at least wears its urban after-hours low rock sound on its sleeve with the refrain “How do I tempt you / Out of the city tonight?” and works well as the album closer. Except it’s not really the closer, because the deluxe edition of the record has four more songs and it’s the only edition available in the UK at this point. Of the four, the Muse-lite “Six Billion” and the chunky “Hanging” just sort of sit there. Sure, they have passion but they don’t have interesting music to back up that passion. The odd “Neon Brother”, with its oblique Doctor Who reference (“If you open my chest you’ll find that two hearts are beating”) and very effective gradual build up to the big rock moment, works really well. And the offbeat “Honey Whiskey”, where Mason complains about being at a boring party but praises the titular libation, may be the only track on the album where the band sounds like they’re having fun. With 16 songs to work with, Nothing But Thieves manage to succeed about half of the time. Nothing on the album is outright bad (except maybe “Painkiller”, but even that is ripping off a really good song), and a handful of the songs are quite good. That plus RCA’s promotional muscle is probably enough to get the band some recognition in North America in addition to the success they’ve already had in the UK. But getting Nothing But Thieves on the radio next to the likes of Imagine Dragons and Walk the Moon just shows how diminished the standard for success is for rock acts in the ‘10s.